In recent months we have seen an influx of at-home gel nail polish kits from several well known brands, offering the polish lover the convenience of a lustrous, long lasting manicure, without the salon prices. Of course, the added benefit of being able to sit at home in your pj's, with messy hair, not a stitch of makeup, and a glass of vino nearby also gains points in my book. Personally, I enjoy painting my nails, and am quite happy to change my polish a couple of times a week. However there are many people who either don't have the time, nor the inclination, and that's where the gel mani enters its own. They are also perfect for holidays/vacations, when you don't want to have to worry about packing nail care items and polish to take with you. Along with it's long lasting properties, comes one of the ultimate benefits in my mind, and that is a manicure that once cured under a LED lamp, is completely dry. Yes, no smudges, no dings, no dents. No sitting around like a princess praciticing your spirit fingers. You can freely, without worry or concern, rummage around in your handbag for your credit card whilst online shopping, and not damage the beautiful mani that you just spent valuable time perfecting. 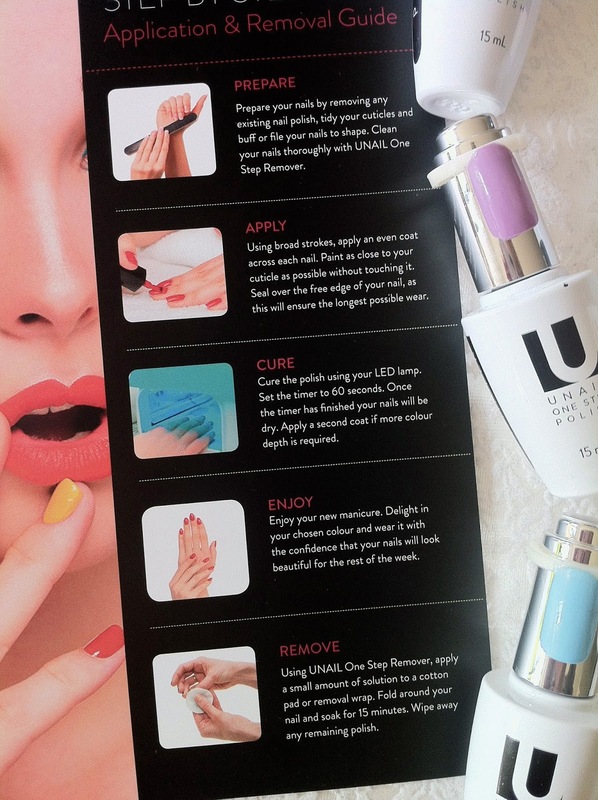 UNAIL One Step Polish is a Brisbane based brand that contacted me recently to try their gel polish. I was immediately intrigued to learn that this gel polish does not require a base or top coat, hence, the "One Step" name. It claims to last to seven days without chipping, cracking or peeling. Nice. UNAIL One Step Polish have a beautiful selection of 36 polishes, ranging from pretty pastels, modern brights, and deep, vampy shades. There is certainly something for everyone! I have the shades Petal, Whisper and Kingfisher to show you today. I have tested and photographed the wear over a seven day period of one the shades, Petal, and will share a few of my thoughts about the process along the way. Each shade comes with a clip-off swatch ring...a very handy feature indeed. I likey. The swatches are a fairly good representation of the shade that will appear on the nail. If I was to be picky, the colours appear on the nail a little more intense, and a little brighter than shown on the swatch. For the purposes of storage, and being able to easily identify the shades, they are perfect. In my kit I received three UNAIL One Step gel polish shades ( 15ml each ) and the UNAIL One step remover, which is essentially pure acetone. I already own an LED light, it is very basic ( ie has an on and off switch ) however UNAIL do sell their own curing light which looks to be very nice quality, large enough to fit your whole hand in at once, has a timer, and comes in pink ( onto the Christmas wish list it goes ). My light is long and narrow, which means I need to cure my thumb separately. PREPARE - I just did what I normally do prior to a mani change. Remove old polish, file and shape if necessary. Prior to starting your polish application, you need to dehydrate your nail bed. I used a cotton bud to apply a small amount of the acetone to each nail. If you have not done this before, do not be alarmed if your nail turns into a ghostly white, chalky mess. This is what acetone will do, and if it gets onto your skin it will do the same. It is just drying out the surface. A clean, dry surface will ensure the best result for your gel manicure. I like to use a balm on the skin around my nails prior to using the acetone, though I am extremely careful not to put the balm anywhere near my nail. This is certainly a step that you can leave until after you have done your manicure. APPLY - I find it best to work with minimal polish on my brush. You have plenty of play time with these formulas, as they do not start drying or thickening as you apply them. They stay nice and fluid. I wipe of my brush on the neck of the bottle, and do the first pass in the middle of the nail, from just before the cuticle to the end of the nail. I then go back and wipe a little more off the brush, and then continue to apply the polish to both the sides. UNAIL highly recommend sealing the free edge of your nail, I just used whatever polish was left on the brush, turned my brush on its side, and gently dragged it across the edge of my nail. CURE - I used my trusty iphone timer function set to 60 seconds, and cured my first coat. One thing I found easy with this system, is that there are no differing times required for each coat. I have used brands in the past where the base coat is 30 seconds, the colour coats are 60 seconds, and the top coat is 90 seconds. It is a small, but appreciated feature for me...and it is good to appreciate the small things yes? It is really up to you as to how many coats you eventually do. I found that three thin coats was required for the shade Petal to reach the opacity that I wanted. Whisper and Kingfisher were an easy two coats, and in fact Kingfisher ( the stunning, glowing blue shade ) could have almost been a one coater. As with all polish brands, there will undoubtedly be variation in the opacity of the formula. ENJOY - it would be indeed a worry if I needed to comment on this aspect, however, I will say that for those who are used to doing a top coat, and then removing the sticky layer that forms on top of the polish with acetone, you do not need to do this! Once your desired colour/opacity is reached, its lights off and done. Back to the dishes, folding washing, flicking through fabulous fashion magazines, running your fingers through your hair...you get the picture. REMOVE - I recently saw a video on You Tube by Tati ( GlamLifeGuru ) who shared a tip on removing gel polish, and I thought I would share it with you! Gel polish removal wraps can be a little pricey, so she suggested grabbing a big old pack of cheap bandaids, applying the acetone to a cotton swab, placing it on the nail, and securing it with a bandaid. Works a treat. One bit of advice I will offer for the removal stage is to leave them alone for 10-15 without disturbing! The first few times I removed my gel polish I was impatient and wanted to check them every few minutes, paranoid about soaking my nails in acetone for too long. What I ended up doing was having to either reapply another cotton swab, and do the whole process again, or pick/scrape off the remaining polish. I am telling you lovelies, if you wait the appropriate amount of time, you will remove the bandaid and the polish will have lifted off the nail and just be sitting there. More damage was done to my nails by having to scrape/pick the polish off. I follow removal with a hefty dose of nourishing oils/balms/butters. As you can see from the photographs above, my polish certainly lasted the 7 days without chipping, peeling or cracking. The gloss and shine did dull a little by day 4-5, but they still looked nice. These photographs are of my left hand. I did have one nail on my right hand which did chip, however this was because I caught my nail in the sodding cutlery drawer and broke the edge of it. Ouch. Otherwise, it is a big thumbs up from me! Some people may find that they will have their mani last longer than the 7 days. Personally, I don't like seeing the big gap between the polish and my cuticle, so off it came. Plus, I wanted to swatch the other shades!! See below!! Two more very pretty shades. Love them both! I didn't test the wear for this manicure, but I can say they are both beautiful to apply, opaque in 2 coats, and nice and glossy! They are based in Brisbane, Queensland, Australia. Starter kits are available to purchase, as well as individual shades, LED lamps, and accessories. I find the prices to be very reasonable, and comparable to what you would pay elsewhere for other brands. Each full size polish is $20 AU, which I will gladly pay when I order some more shades! 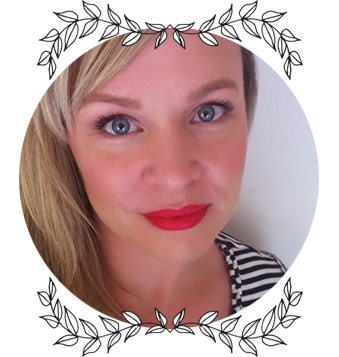 I am also extremely excited to let you know that the lovely people at UNAIL will be offering my readers a discount code which will entitle you to Free Standard Shipping within Australia! This code will be valid until 31st October. I would love to know what shades tickle your fancy! Have you tried UNAIL One Step Polish? Disclaimer: As mentioned in the body of this post, these products were provided for the purpose of review. There are no affiliate links present. I do not receive renumeration when you use the discount code, it is just for you, courtesy of the lovely people at UNAIL. Cheers. I was recently offered the opportunity to try some nail polishes from the brand LCN, by a lovely Australian distributor based in Victoria. LCN Nail Polish is a German brand, and one that I had never actually heard of before. SO what does a nail polish lover do when a carrot is waved in front of her face?... she says yes please!! After I had perused the site and chosen some shades, my package arrived promptly, accompanied by a delicious smelling Banana Hand cream. Just one of the many scrumptious scented hand creams which are available from the website, along with a variety of nail care items. LCN Nail polishes are $4.99 AU each, and contain 8ml of product. To compare, they are the same size as the smaller Rimmel London polishes. I think the price is very reasonable, and let's be honest, it takes quite a while to work through a regular 15ml size bottle. One could also then feel justified in purchasing a few more shades for one's collection...no? I have really enjoyed all three shades, and found them to apply and wear very nicely. The brush is a fairly standard size, not wide or curved, but I did not have any difficulties using it. The formula is 5 free, gluten free and not tested on animals. My apologies for the wide variation in lighting for my swatches, but that's how we roll when relying on natural light, and not being a professional nail blogger! Do feel free to google swatches if you would like to! All swatches have a top coat of Essie's 'Good To Go'. I have to confess, it was the name of this polish that caught my attention, along with the cool toned neutral base and pretty, tiny holographic glitters. This shade is what I consider to be grown up, but still a little glam. 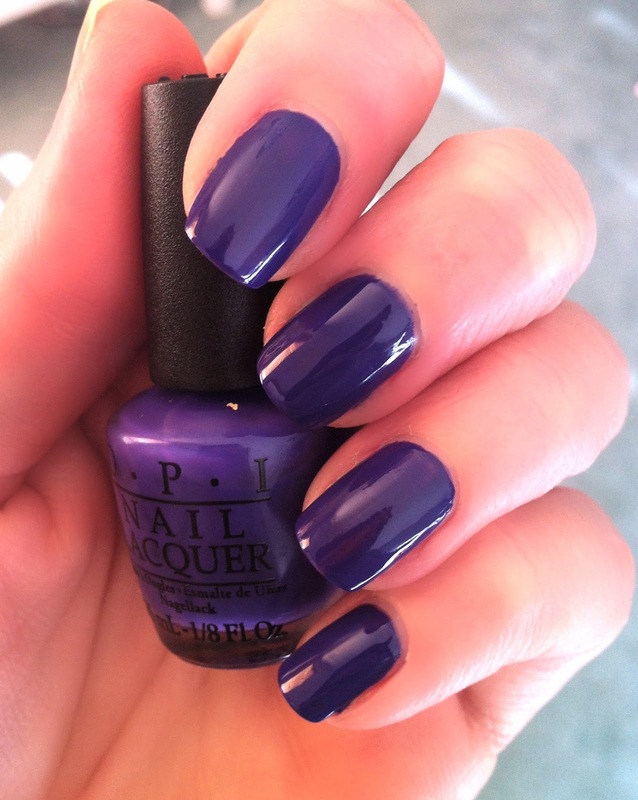 The perfect summer shade for fingers and toes! I used three coats in the photo above, she is a little on the sheer side, but a lovely formula none the less, and makes a beautiful manicure in my opinion. I am a sucker for a good mint green polish, and this one did not disappoint. It has a lovely formula, very easy to work with, and opaque in just two coats. It wore very nicely, I had one small chip and some minor tip wear by day 5, and removed it on day 6. A beautiful shade. I believe this shade is a cream/jelly hybrid, you can see from the photo above how juicy it looks!! Such a pretty raspberry shade, and appropriate for all year round I think. A gorgeous formula that glides onto the nail with ease. Two coats for a gorgeous shiny finish, even before a top coat! Again, 4-5 days of wear with no chipping. You can find LCN Australia here. Shipping is a flat rate of $10 Australia wide. Many thanks to LCN Australia for providing these products for review. I have no affiliation with the company, and was not sponsored to provide this review. Cheers. BRIGHT PINK Lipstick Day! Wear, Share, show you care! Bright Pink Lipstick Day is a campaign run by the organisation Pink Hope, in the effort to raise awareness, promote discussion and offer support to those families affected by hereditary breast and ovarian cancers.
" Krystal was one of the first women to publically share her story and preventative surgery, giving a face and awareness to prevention" ( quote taken from Pink Hope's website ). Prompted by dusting off your favourite pink lippy, and sharing a selfie on your social media, Bright Pink Lipstick day, on Friday 26th September is all about encouraging all of us to Kiss and Tell... to get talking to someone close to you about the history of cancer in your family. There is a wealth of information on the Pink Hope website here. I have spent the morning reading the stories of some incredibly brave women. Having the privilege to read about what these families go through will undoubtedly give you a sense of what Pink Hope is all about, and it will further your own understanding of how these families came to be tested for the BRCA1 gene, and some of the heart breaking decisions they face as a result. Please read their stories. You will also find many ways in which you too can help, whether it be hosting a fundraiser, making a donation, or purchasing some items from the shop. Below are some photos of some things I purchased, which happily arrived today at The Beauty Vine HQ. Jessica Hart, a well known Australian model, is soon to be releasing her own brand of all natural cosmetics, LUMA, later this month. Jessica has collaborated with Pink Hope to create a bespoke shade of pink lipstick, aptly named, Pink Hope. This lipstick will be available to purchase from Priceline Pharmacy in the next few days, and is available to purchase now from the Pink Hope website. You will see me sporting this next week! There are three candles to choose from in the shop, I chose Inspire, which is fragranced with Jasmine. 100% of the purchase price of the candles will go to Pink Hope. They make a lovely gift, and my house is currently smelling gorgeous and a lot like Spring! And what beauty lover can pass up a pretty makeup bag I ask you? You can also text the word "PROMISE" to 0477 567 465 to make a ten dollar donation. WEAR, SHARE, SHOW YOU CARE! Thanks so much for stopping by, and blessings to all the families affected by this, whose stories I have had to privilege to read, thank you for inspiring me. If you are a regular reader of my blog you will know that I am a big fan of chemical exfoliation, ( if you are a regular reader of my blog, then I am a big fan of you! ). In fact, I don't think I have used a physical ( or granular ) exfoliant for the better part of 18 months. So when I was recently gifted the Antipodes Reincarnation Pure Facial Exfoliator, I was slightly hesistant to give it a go. In the past, I have found granular scrubs to be less than helpful to my combo/oily/acne prone complexion. I found them to be irritating, increase inflammation, and they would often spread the infection from current blemishes that I was experiencing. Not nice. However, this product has changed my mind. Antipodes Reincarnation exfoliator is luxurious, nourishing, and very gentle on the skin. As Antipodes say "offer your skin new life"....alrighty then! The base of kaolin, and apricot and avocado oils house very tiny jojoba beads. You may be able to see the texture in the photograph above, but they are very small. It has lovely dose of antioxidants from carrot seed oil and grapeseed extract, and calendula to calm and soothe redness. The fragrance is subtle and spa-like, with tonka bean, sweet orange and cedarwood blending together beautifully. After cleansing, whilst my face is still moist, I take a blob about the size of a small grape and smooth it gently over my face. Using my finger tips, with very light pressure, I massage the product over my skin. I do avoid massaging blemished areas, however I use a very gentle press and roll motion over the areas where I may have blemishes that are not infected and are starting to heal. The texture is thick, creamy and luxurious, and rinses away nicely. Because it has an oil base, I follow with a warm/hot flannel just to finish off, and to make sure I have removed all of the product. My skin feels soft, smooth and looks plump and fresh. On with the hydrating mist, serum and moisturiser, and my makeup just glides on. Lovely. Antipodes recommend Reincarnation Exfoliator for all skin conditions. It's recommended retail price is $42.00 AU. Worth every penny if you ask me. I will certainly be purchasing. I would probably reach for this around once a week, or whenever the mood takes me. Even though it is very gentle, I avoid using AHA's or BHA's on the same day. I believe that it is recommended to do so, as it can be irritating to the skin. The surest sign for me that my skin is irritated, apart from inflammation, is increased oil production. Two things I try really hard to avoid, so I will heed that advice. For you Aussie's, Antipodes is available at Priceline Pharmacy where is it currently 20% off!! I can't actually see Reincarnation online, but I have noticed it in-store, so do check your local area. I have also just found it on Myer's website here, and they currently have a gift with purchase as well!! It is also available online at Adore Beauty ,(one of my favourite online beauty stores), and Feel Unique and Beauty Bay both of which offer free worldwide shipping. If you are interested in reading about Antipodes Aura Manuka Honey mask, I have favourably reviewed it here. Have you tried Antipodes Reincarnation pure facial exfoliator? Are you a crushed walnut shell lover? (save it for your body). What is your favourite gentle exfoliator? I would love to hear from you! Please feel free to ask questions or leave a comment below!